Exclusive to Melbourne, Monet’s Garden: The Musée Marmottan Monet, Paris will feature more than sixty works devoted to Claude Monet’s iconic garden at Giverny. Monet’s Garden traces the evolution of these garden motifs over a period of twenty years, revealing the transition of Monet’s purely Impressionist style to the more personal pictorial idiom that he adopted in later life. The exhibition will include more than fifty masterpieces from the Musée Marmottan Monet, Paris, as well as other paintings from leading international museums and private collections around the world. Early photographs of the artist and his garden will also be on display. Opening with a pair of portraits of Claude Monet and his wife Camille painted in 1872 by Pierre-August Renoir, the start of the exhibition tells the story of Monet’s early life. The exhibition then takes visitors on a journey beginning with Monet’s arrival in Giverny in 1883 and the first steps taken towards the creation of the garden that would serve as inspiration for the remainder of Monet’s life. The first section of the show will include a series of paintings that Monet produced during the years the garden at Giverny was being laid out. These were created in Normandy, in the valley of the Seine, or during Monet’s travels to Norway and London. Highlights include Field of Yellow Irises at Giverny 1887 and Parliament, Reflections on the Thames 1900. The second section of the exhibition will consist entirely of paintings representing Monet’s beautiful garden at Giverny, produced between 1897 and 1926. Mr Ellwood said: “Through these paintings, visitors will experience every aspect of Monet’s garden; the iconic Japanese footbridge, the waterlilies and other flowers including irises, agapanthus, wisteria, the weeping willow and the alley of roses. “The show concludes with a spectacular, specially commissioned filmic installation which will immerse visitors in the daily beauty of Monet’s garden as it is today. Entitled ‘The Last day at Giverny’, it will present Monet’s beautiful garden from sunrise to sunset on the last day of the season this year. This circular display will surround and embrace visitors leaving a powerful parting impression of Monet’s garden,” said Mr Ellwood. The exhibition will also present a series of rarely seen late works by Monet; some of the last easel paintings created in the garden in Giverny as the artist began to lose his sight. 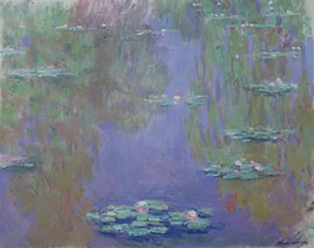 These works represent a radical departure from Monet’s earlier style and will provide visitors to the exhibition with the unique opportunity to explore a lesser known period in the artist’s life.